An Angel type Digimon which took on the form of a child; he is said to have descended into the Ancient Digital World long ago. He appeared at a time where the Digital World was still new and disordered, and it's recorded that he brought peace and order to this world. But there also came a dark age brought on by the treacherous Lucemon after this happened, and a mighty 'Rebellion' broke out. He has power and intelligence contrary to his child-like form, but enough to surpass even that of Ultimate-leveled Digimon. It's said that, at this moment, Lucemon's abilities have been divided and inherited by the Three Great Angels. His special attack is "Grand Cross", which creates 10 super-hot photospheres, aligned in the shape of a cross and positioned like the planets in our Solar System. This attack's power surpasses even Seraphimon's "Seven Heavens" attack. Origin / Italian. Luce means light. 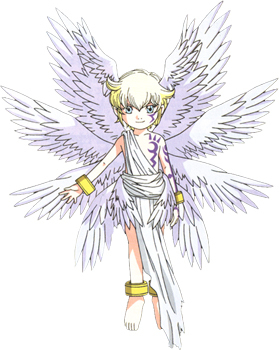 Lucemon's name and appearance originate from Lucifer, which means 'Light Bringer' in Latin. Lucifer was God's Angel of Light. Origin / Italian. Luce means light. 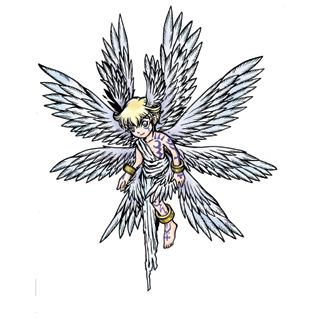 Lucemon's name and appearance originate from Lucifer, which means 'Light Bringer' in Latin. Lucifer was God's Angel of Light.